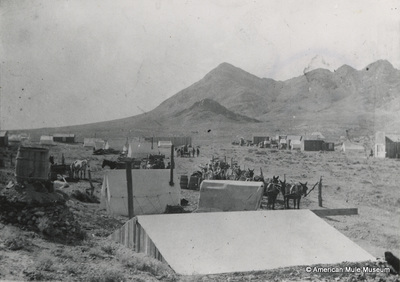 In the mid-1800s, early settlers in towns and mining camps in Inyo and Mono Counties needed larger and heavier items such as lumber, building materials, farm equipment, or machinery. The nearest railroad lines were hundreds of miles away. 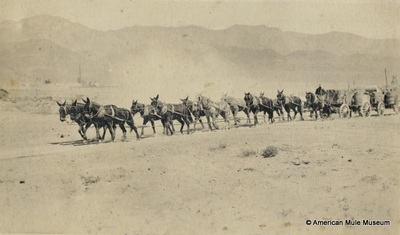 Fortunately there were freight haulers, a group of sturdy individuals with the unique skills necessary to drive heavy freight wagons pulled by large teams of mules and horses. 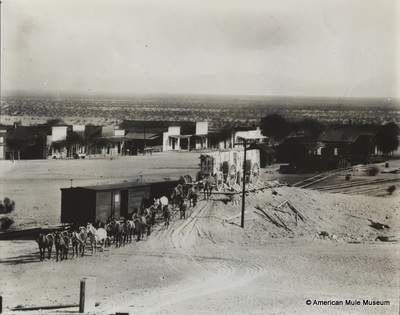 It’s been said that without the freighters and their dependable mule teams, the task of meaningful settlement of California’s “Last Frontier” would have been delayed, at least until the arrival of a rail line. When motorized trucks began hauling freight from Laws to Bishop, the days of the freight wagons and mule teams soon came to an end. William Arcularius came to the U.S. from Germany, arriving in Inyo County in the early 1870's where he settled on a homestead in Round Valley. Mining provided a greater opportunity than did farming, so Arcularius purchased a team of 18 mules and two “wheel horses” and began a freight hauling business. He began his operation in Bodie, hauling ore to Placerville and returning with lumber and supplies needed in Bodie. When the mining “booms” ended, he returned to his operation in Inyo County. 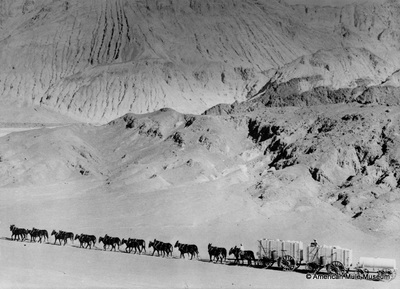 He hauled borax at Calico, then on to Cerro Gordo, Keeler, and Darwin, where he transported ore out and brought needed supplies back. 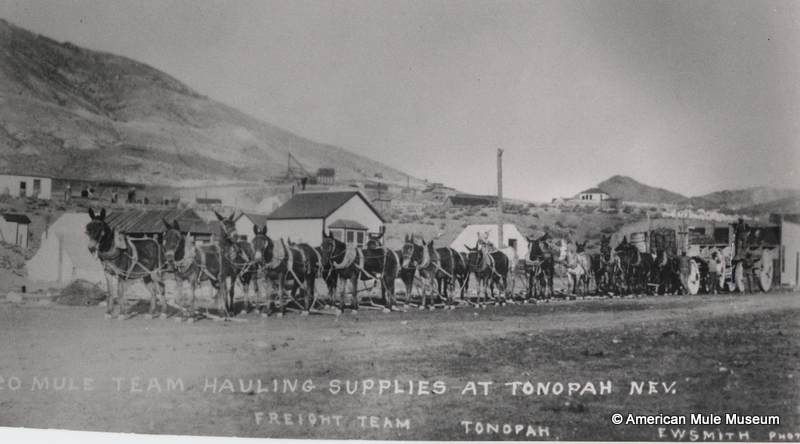 With the great gold mining boom of Goldfield and Tonopah, Arcularius, hauled ore from mines to the smelter at Tonopah. After his death in 1902, his team was sold to the operations of the soon-to-be-famous “Twenty Mule Team Borax Company”. 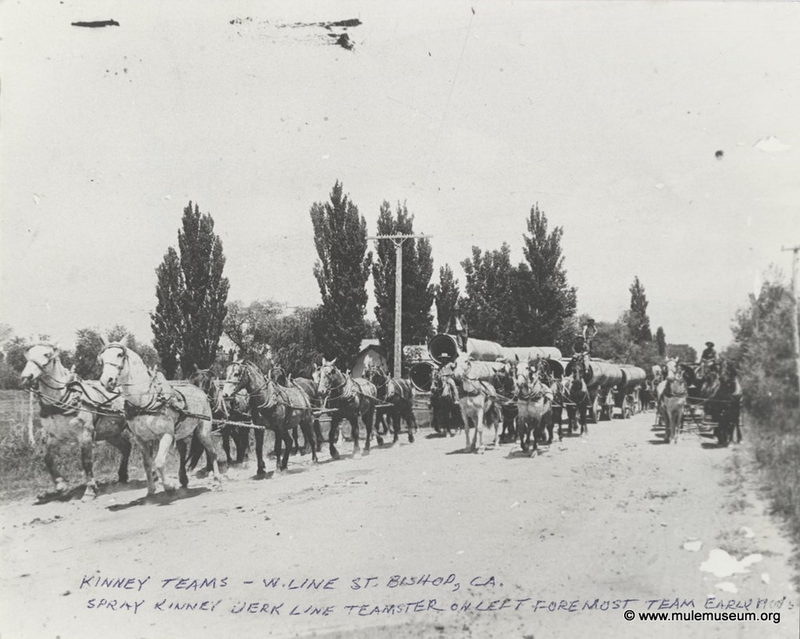 George C. Kinney and his son, Spray, were freight teamsters in the eastern Sierra and transported wood, mining equipment, and “whatever needed hauling”, between Bishop, Mammoth, Benton, Bodie, and various Nevada mining towns. George Kinney, often used his blade to level the most uneven ground. He was also quite an inventive “engineer” and since more than brakes were often needed to move a heavy wagon-load down a steep grade, he forge-welded a light chain to “roughlock” the rear wheels onto a “Wheel-sled”. The entire rig was then sledded down the grade to more level land. George and Spray Kinney also made use of a clever device called a “dolly” to get around tight curves in mountainous country. To solve the problem of loss of pulling power when his team had to round a bend, a team was placed both in front of, and behind the wagon, giving the rig both “pullers’ and “pushers”. At the end of the back tongue was the “dolly” made from two buggy wheels on an axle, with a driver and reins. Teamster R. J. Schober spent much of his life freighting produce from Owens Valley to Los Angeles, then hauling needed supplies, equipment and machinery back to the Valley. 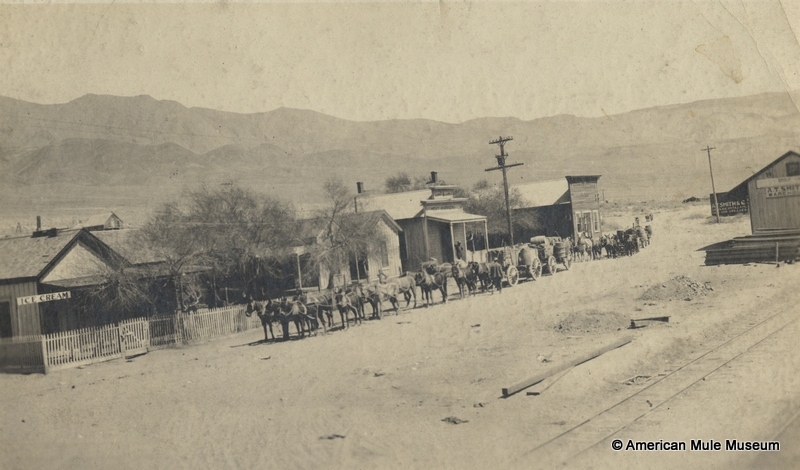 After the Carson & Colorado Railroad arrived in the Valley, Schober moved on to more profitable work, transporting silver-lead bullion out of Panamint Valley. 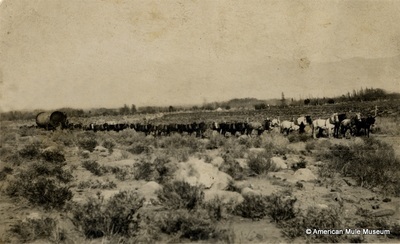 Early in the 20th century, he contracted with the Southern Sierra Power Company to move machinery and other supplies. 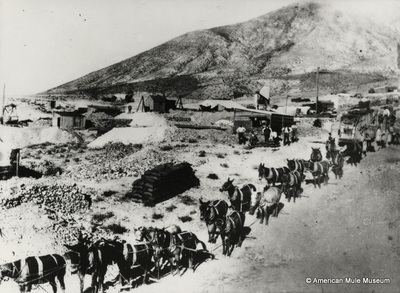 Schober then received a contract with the Saline Valley Salt Company to carry heavy timbers and all the necessities for the construction of the famous Saline Valley Tramway. With summertime temperatures in Saline Valley sometimes reaching 120 degrees, Schober was careful not to overwork his team. He would stop the team before they got tired enough to stop by themselves, but would never rest them longer than necessary. After the Saline Valley job was completed, R. J. Schober sold most of his mules and equipment, except for a few of his favorite animals. In 1878, brothers John and Patrick Conway left Ontario, Canada, for the California goldfields, arriving in the eastern Sierra at the peak of the mining boom in Bodie. Bodie had some 20 mines in operation producing an average of $20,000 worth of bullion each day. 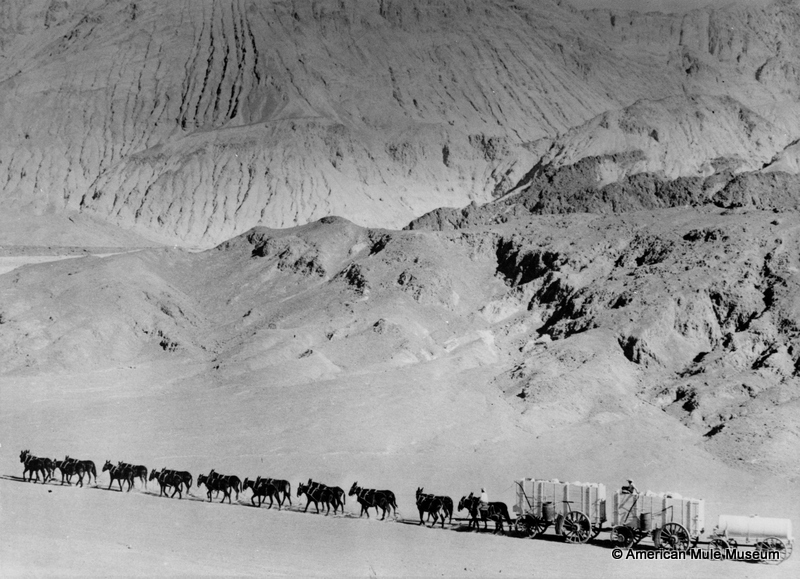 The Conway brothers filled the need for freighters and drove their 20-mule teams in and out of Bodie. John Conway became a successful blacksmith and wagon-maker as well as rancher. He supplemented his income by hauling freight from Bodie to Candalaria, Hawthorne, Lundy, Mono Mills, and other locations. In 1907, John Conway furnished two teams and freight wagons to move over 40 tons of machinery and pipe from Minden, Nevada to Mono Lake during the short-lived oil boring activity. John also trained mule and horse teams, which he sold from Virginia City to Tehachapi. One of the most important Owens Valley transportation companies was Remi Nadeau’s Cerro Gordo Freighting Company, organized in 1873. 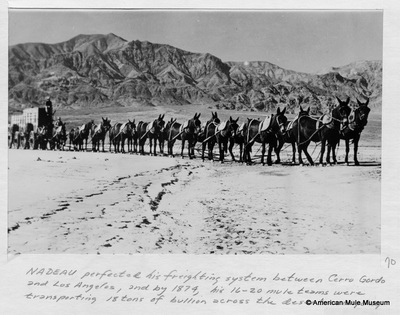 Its primary purpose was to transport Cerro Gordo silver-lead bullion on a regular, systematic schedule to Los Angeles and carry supplies for the mines on the return trip. Nadeau, a Canadian, arrived in California in 1861. 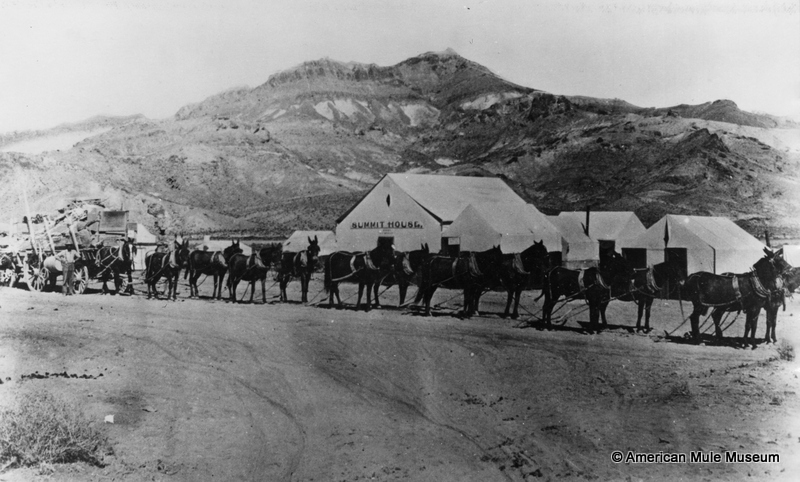 Nadeau soon became the undisputed “king of mule-wagon freighting” in the eastern Sierra. 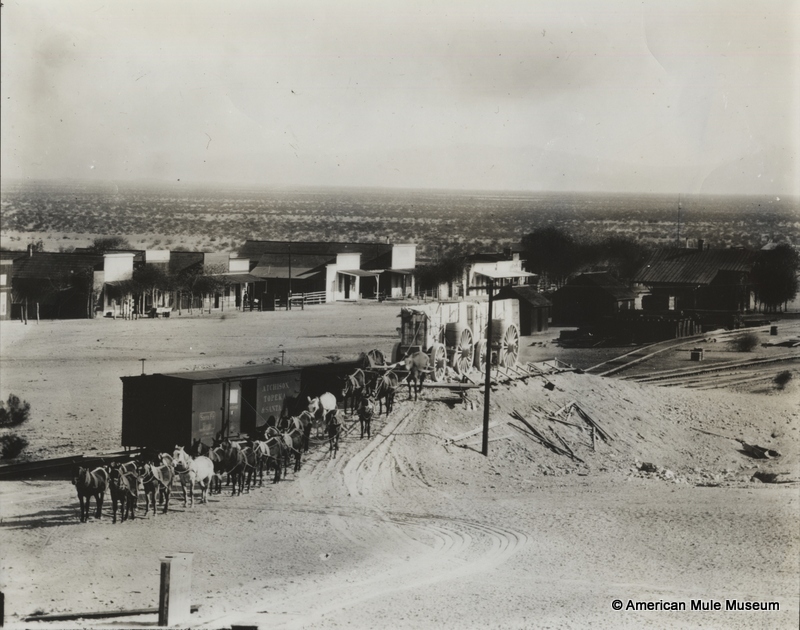 The 230-mile road from Cerro Gordo to San Pedro became known as the “Bullion Trail”, or the “Nadeau Road”. 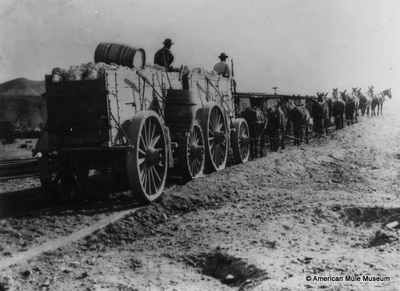 Eighty wagons were specially built for that undertaking. The wagons were enormous affairs, each capable of carrying the same load as a narrow-gauge boxcar (about four tons) and 56 of them were constantly in regular service. 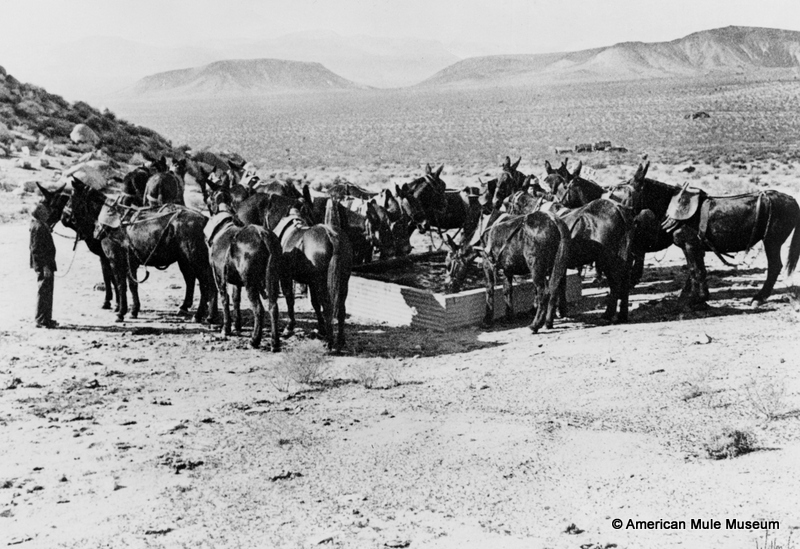 Each outfit had from 16 to 22 mules and horses assigned, and were scheduled for about 22 days on a round trip. Stations, watering places, and camps were provided along the way. The company was the first to provide regular and dependable service and soon had 100 teams, dominating the bullion transport operation until 1881. Nadeau also hauled freight to the small towns of the Eastern Sierra from Lone Pine to Mammoth. 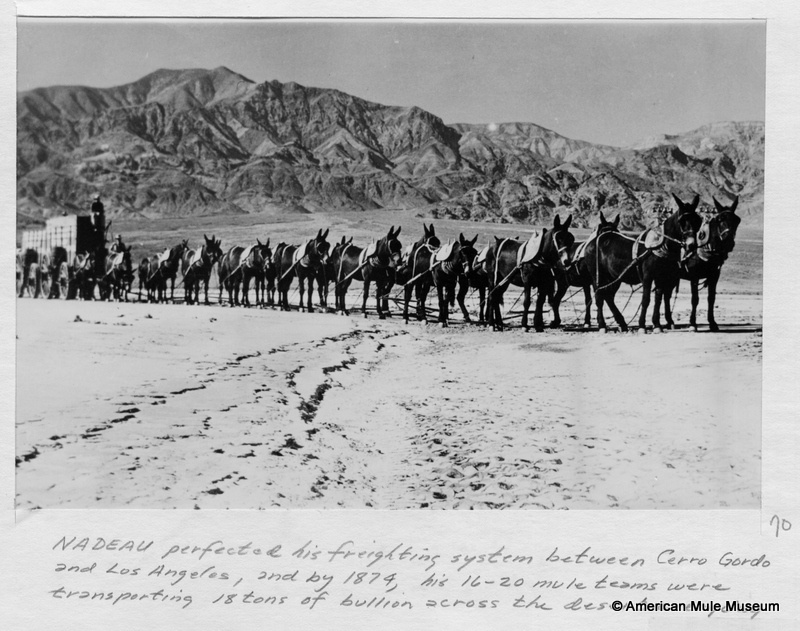 Although Nadeau was not the inventor of long mule teams, he was the first to use such large outfits on the California desert on vast scale.